"Paceform is very accurate in predicting potential race outcomes and, more importantly, how a race is set up. No wonder they get so many winners." If you are a newcomer to horse racing or you have been involved with the sport of kings for any length of time you will probably understand the huge number of factors that go into the art of making successful horse racing selections. Every possible variable is taken into consideration by the many ratings services that spend lots of man hours and resources in bringing their information to you. But if all these ratings services are all pointing to same top rated horse it is going to win .... right ? The answer would of course be yes if all the horses ran exactly as predicted and in exactly the same way each time. However going reports are often way off the mark and one major factor is missing from these equations and that is PACE. Through our use of horse racing pace not only do we know when horses have the best possible chance of winning at BIG PRICES but we also know when short price favourites are not going to have the race run to suit their style. There is no other horse racing service available in the UK today that uses our unique and extremely successful approach. We are your real opportunity to make your horse racing betting successful. A horse racing system that really works? It is so easy and you can start winning today! We lead where others only follow. one step ahead of the Bookie at all times !! 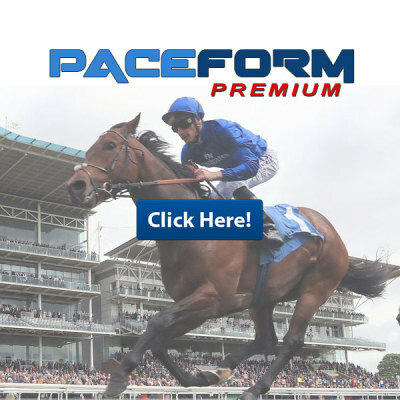 Paceform appeals to all types of horse racing enthusiasts, both amateur and professionals. In a similar way to golfers referring to handicaps when playing golf, horse races use speed figures but an alternative method is to use ‘pace’ figures. Such figures are often ignored as they are misunderstood and hard to calculate with them often being a ‘best guess’. The idea behind a pace ‘handicap’ is that the fastest horse from the start of a race is most likely to get the lead, placing it in front and most likely to win. Those who use such pace figures also emphasise the importance of knowing how a horse ran its last race. A horse that ran an extraordinarily fast ‘pace’ in its last outing may have run out of steam and finished behind other horses, but that very same pace may be enough to win a race against slower competitors. In its current race, a horse may well be faster than its speed figures or past performances suggest. Judging if a fast or slow pace will help a particular horse is often what those using such handicap systems look for in a race. There are a lot of enthusiasts that believe it necessary to determine such pace figures for each race with a view to help determine which horses will indeed benefit. Alternative methods include using the pace figures to view horses that are equal or indeed better, as well as looking at those horses that have dropped a class or had equipment added or removed. A given pace figure may only equal others in the same race but, being scored against a tougher group means the pace figure and drop down angle works well here. Paceform has calculated ‘Pace’ and ‘Speed’ figures for you and includes this information so that you have everything you need to help with your selection process. A horse racing system that really works? It is so easy and you can start winning today! With a huge volume of satisfied members, Paceform has very quickly become one of the UK's leading horse racing data-collectors and compilers. Utilising a vast array of information, we quickly established that our databases could be utilised to a more profitable* venture for our valued members. As such, we have created a large number of complex calculations which will assist our members to not only track and monitor race information, but also help establish potential profit* in forthcoming races. In doing so, we are in an excellent position to provide our members with a series of official ratings, speed figures, horse abilities, individual horse performances during a race as well as many other advantageous analytical information. Bringing all this information to our members' fingertips, under one roof, has enabled our members to become more profitable* in their horse racing ventures. We lead where others only follow. We always aim to help our thriving members keep one step ahead of the Bookie at all times !! Paceform appeals to all types of horse racing enthusiasts, both amateur and professionals, every day around the world to give them the most accurate ratings for every horse running in the UK and Ireland. We have created a highly successful rating system to help assist 'all' members in achieving an increased profit* which has proven to be extremely popular and has changed lives!. We list every race, as well as history on the horse, their jockey, trainer and owner so that you can judge the competition and immediately begin analysing every UK Flat, All Weather, and Jumps race in detail. ACT QUICKLY - MEMBERSHIPS ARE LIMITED!! Complete online service, no software to install - A mathematically proven approach. We operate a 'user-friendly' selection process - We have a very high percentage of winners. We achieve success for our members - We offer a fully interactive experience. Join us today and you can be part of the most successful group of racing enthusiasts anywhere in the world !! Don't worry - even if you are a novice to the world of horse racing, and you feel overwhelmed, please remember that our help and advice is never more than a quick e-mail away. Paceform - The Winning Formula!! Undoubtedly the best horse racing statistic website on the net! *Paceform is not a tipping service with inside information. Any subsequent bets are placed at your own risk, we would refer you to our 'Betting' page for further information. Copyright © 2002 - Paceform. All Rights Reserved.